Preheat oven to 400 degrees F. Generously spray 12 count muffin tin with nonstick cooking spray. In a large bowl combine flours, granulated sugar, baking powder, baking soda and salt; stir until all ingredients are well blended. In another bowl, whisk together the buttermilk, butter, eggs and vanilla. Make a well in the middle of the dry ingredients and pour in the liquid mixture; then add the blueberries. Gently fold ingredients just until moist; do not overmix. Spoon batter evenly into muffin tin. Cups will be close to full. 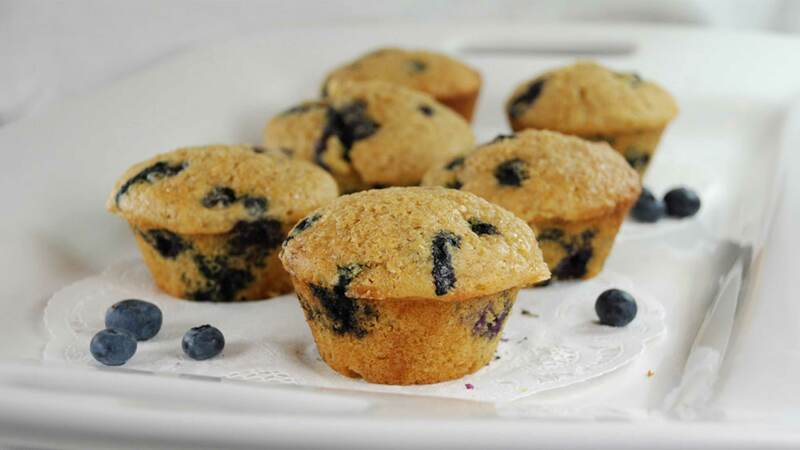 Sprinkle the top of each muffin with about 1 teaspoon turbinado sugar. Bake for 18 to 22 minutes. *No buttermilk? Substitute 1 1/2 tablespoons lemon juice and enough milk to make 1 1/2 cups.